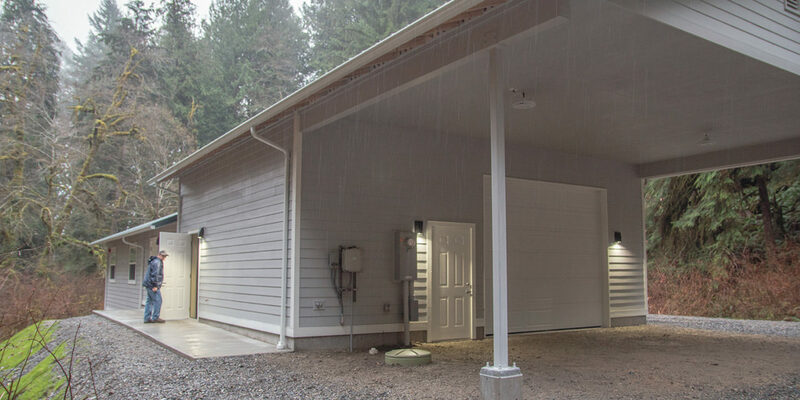 The Skokomish Tribe recently expanded its Enetai Creek Hatchery facility for the first time in more than 40 years, improving the working conditions and increasing the capacity to raise fish. A new 1,582-square-foot support building has been constructed up the hill from the tribe’s existing facility. Since 1976, the tribe has been using a 684-square-foot garage as an office, workshop and incubation room for production of up to 3.5 million chum salmon eggs every year. The new building primarily will be used for offices, meetings, equipment repair and a wet lab. “By moving a majority of those day-to-day functions into the new building, we’ll be able to use the old building much more efficiently as a dedicated incubation room,” said Dickie Adams, a Skokomish hatchery technician. In addition, the hatchery has 14 raceways and circular tanks for rearing fish, plus a spawning facility across the highway at the mouth of Enetai Creek. Hatchery manager Robert Blankenship, who took over last summer, has been implementing small changes reflective of his time as a hatchery manager in Alaska. With the additional space for production, Blankenship plans to bring in more incubators and increase the egg take. The tribe is also considering plans to produce additional salmon species and operate the hatchery year-round. “The more fish we raise, the more fish will be available to harvest by everyone,” Adams said.